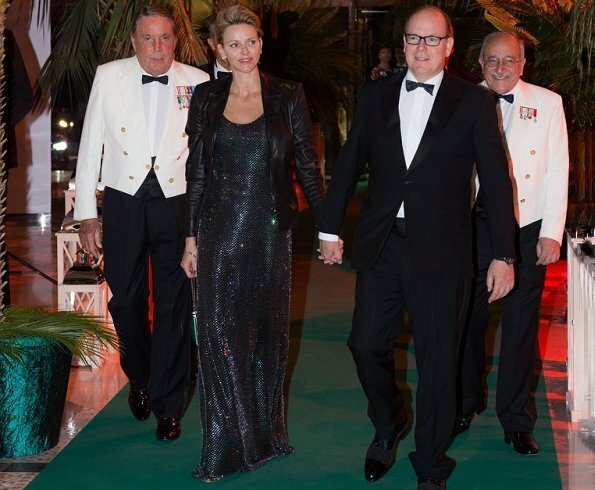 On May 27, 2018, Prince Albert II of Monaco and Princess Charlene of Monaco attended the ACM Gala Dinner as part of the 76th Formula One Grand Prix of Monaco at Monte Carlo Sporting (Salle Des Etoiles). I don't like this outfit all at. She can do better. Leather jacket and evening gown,well that is a new one,it don't look bad with the jacket but without it is a shiny tank top at least the top. No lipstick or to pale don't look that good. Yes she can do better. I don't love this dress but I like the darker hair and the make up. She looks pregnant....am I the only one who sees the small bump even through a roomy dress?! It is the mairmaid-look which gives the impression of pregnancy, IMO. het is een prachtig stel ,en altijd zo gelukkig!!!!! The colour of the dress and Charlene's darker hair colour seem to wash her out. Not one of her best looks.